I don't know if anyone actually downloaded the Silvestrov I posted a few days ago, but if not, here's another. This one is a bit more traditional, yet still totally original and wholly beautiful. It's a symphony piece, so no baritone singing, just great mood music. I don't know much about it and don't have the cd to type the liner notes, but I'll post a BBC review for those interested. It's really nice. Dark, but done in a really great way. Just wonderful modern classical music, I suppose. Whatever. If you haven’t yet encountered the music of Ukrainian composer Valentin Silvestrov, then it’s time you did; he seems to have been writing his ‘postludes’ for symphonic musical history for a good twenty years. Silvestrov calls his orchestral works ‘symphonic poetry’, or sometimes ‘metasymphonies’ where time flows in a wholly different way. He’s not alone in this, of course: other contemporary composers such as Pärt, Gorecki, Tavener, Vasks and Rautavaara are capable of warping the passage of time, yet Silvestrov has his own fully-saturated musical language, plus a post-Mahlerian sense of scale and all-encompassing humanity. 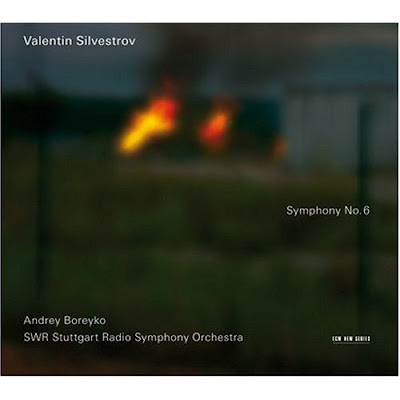 Silvestrov’s Fifth Symphony has already been recorded several times, becoming something of a cult hit in the East thanks to a now-deleted Melodiya recording. There was a fourteen year gap before the Sixth Symphony was finished in 2000: a five movement work described in the notes as ‘a living tissue of sounds, charged with deep dynamic forces, [which] sparkles and breathes as if bathed in sunlight or caressed by gusts of wind.’ I like that…except that it gives you no real idea of the yawning chasm from which the work seems to drag itself, shuddering and groaning towards that light. So…is the Sixth Symphony about anything? The composer talked in an interview about its ‘atmosphere of imminent disaster’, and with hindsight that seems prescient: Silvestrov’s musicologist wife Larissa died unexpectedly just after he’d finished the first draft in 1996, and he included a coded cipher of his wife’s name in the final bars. The notes refer to the opening of the symphony as ‘primordial chaos’…churning, bass-heavy chords that rumble ominously as piano notes and vibrato-less strings pierce the gloom like shards of shattered glass. Threads begin to appear, strands of melodic DNA being pulled from the slime to shimmer on the surface of this dark pool…until droplets of pizzicato at the start of the second movement send ripples to rouse the grumbling monster in the depths. The brass becomes dominant, until a dense string chord insists on silence, and the melodic material emerges on the violins, intact for the first time. The multi-stranded layers of constantly shifting sound dwindle to a roll of timpani and a single, hushed cello. Then comes the massive middle movement, 25 minutes long, dwarfing those around it, evoking (and quoting) the famous Adagietto from Mahler’s Fifth Symphony. Silvestrov constructs a breathtakingly beautiful centrepiece for his symphony, extrapolating on the sighing strings and the sense of timelessness that were already there in Mahler’s original, with a cascading string sound that would have Mantovani doffing his hat in respect. Then there’s stillness; an Intermezzo that’s all shimmering surface, glistening with harp, piano, celesta, and harmonics from the upper strings…a ghostly vision, slowly fading as tendrils of mist envelope the concluding chord. But all the time we’ve been making a slow, delicate descent…and when the brass growls and woodwind shrieks assail us at the start of the finale, the music is overpowered by a sense of horror, and desperate loss. We end where we began, with the last melodic remnants dissolving into infinite blackness. Given Silvestrov’s personal history, his Sixth Symphony could feel as though it’s all about him, yet he transcends the autobiographical in a work that encompasses us all. The playing is superb, capturing the most delicate hues and gentlest whispers of the score, and the immaculate recording provides the inky blackness from which the music emerges and into which, at the end, it decays. Like so much Silverstov, you don’t have to know how or why it works to be deeply affected by it. It feels simple, yet it obviously isn’t; it’s profoundly beautiful, timeless, and unforgettable. Thanks for these Silvestrov albums!